CGM-NV specializes in the manufacturing of tamper evident security tapes. Our tamper-evident technologies are designed to identify pilferage and physically protect unattended cargo in boxes, courier packs, envelopes, drums, on pallets or in trailers. When removed, the tape will reveal the hidden message "OPENED". Our stock tapes includes unique serial numbers for added security. Tapes are offered in multiple widths and multiple colors (for color coding). Stock tapes are available for immediate shipment -- order by 2pm and the order ships the same day. We also offer custom security tapes at affordable prices, low minimum order quantities, and fast service. 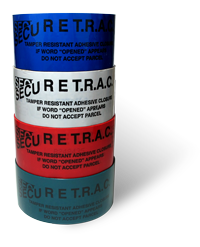 Because we manufacture the security tapes, we can usually produce your custom tapes within 2 weeks. Customizations include the visible graphics, the hidden VOID message, specific serial number ranges, custom inks, and the tape configuration (film thickness, adhesive, width, length). For machine-applied tape, we offer rolls up to 3,000 lineal feet in length. Please call for more info on custom tape. If you have a special application or supply chain issue, please call us at 888-416-0443 for a free consultation. The EVT2R-235AP-164 security tape features a full adhesive transfer when removed. All of the adhesive remains on the surface and no adhesive remains on the tape film. The tamper evident feature will function within one minute of application on the recommended surfaces. Perforated every 6 inches. This security tape is also TSA-CCSP compliant. This 2 inch wide security packing tape has a white background with blue diagonal lines, which provide a visual indicator if the tape is slit to open the package. The PST-RC-2R-V90 security tape features a full adhesive transfer when removed. All of the adhesive remains on the surface and no adhesive remains on the tape film. The tamper evident feature will function within one minute of application on the recommended surfaces. Perforated every 9 inches. This security tape is also TSA-CCSP compliant.